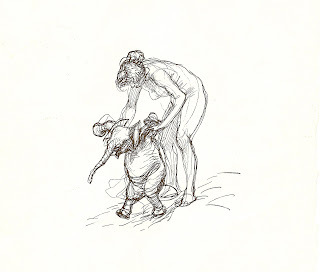 The first time I saw this sketch was in Germany in the late 1970's and I fell in love with it. But being "in transit" so to speak there was no room for pieces of art in my portmandeau. So I settled on the sketch book- indeed that is the title of the book- "Skizzebbuch" or Sketchbook in German. Apparently at some point the book was taking up too much room as well, and so I ripped the page out which is reproduced here. The reason this sketch means so much to me is simple enough to understand in retrospect. I was very lonely traveling as I did, and this sketch represented to me, my own awdwardness and inability to sucessfully survive on my own. And the beautiful woman helping the elephant learn to walk was my ideal of finding someone who would help me through life's awkward steps, for which I was ill prepared.